This piece is written for Jehovah's Witnesses. It assumes a knowledge of the Watchtower Society's teachings. [B] How bad a sin is it? One proof of 1914, the Gentile Times, was enough for Russell. Are 14 proofs of 2008 enough for you? The Watchtower Society hinted strongly that since 1975 was 6,000 years after Adam was born according to their chronology, it could mark the start of the 1,000 year Sabbath over which Jesus is Lord. They did not categorically state this to be their doctrine but neither did they categorically deny that it was their doctrine (until 1976). So the Shepherd failed to give any concrete leadership in this matter to the flock and as a result the sheep were scattered all over the place. Many Witnesses thought that 1975 was it, and many others were not sure. When the sheep are scattered all over the mountain one must blame the shepherd not the sheep. It is the job of the shepherd to look after the sheep. However, it is easy to see that God's last creative act was not the creation of Adam, because he created Eve. Then after the pair of them had sinned, he created ageing bodies for the pair of them. This was his very last creative act. Yes he made them some clothes, but the greater meaning is that he made them some 900 plus year long ageing garments of skin to replace the indefinitely long non ageing garments of skin that they had before they sinned. So the 6th creative day ended at the eviction of Adam and Eve from the Garden. So the big question therefore is: When did Adam sin? When was he evicted from Eden? For if we add 6,000 years to that date, then we will have the start of the Kingdom of God. These are the questions that the Watchtower Society should have kept on asking, these are the doors that they should have kept on knocking upon, these are the treasures that they should have kept on seeking, but they stopped as Isaiah foretold when he said..
19 Who is blind, if not my servant, and who is deaf as my messenger whom I send? Who is blind as the one rewarded, or blind as the servant of Jehovah? 20 It was a case of seeing many things, but you did not keep watching. It was a case of opening the ears, but you did not keep listening (Isaiah 42). 36 Concerning that day and hour nobody knows, neither the angels of the heavens nor the Son, but only the Father (Matthew 24). 32 Concerning that day or the hour nobody knows, neither the angels in heaven nor the Son, but the Father. 33 Keep looking, keep awake, for you do not know when the appointed time is (Mark 13). Most bibles translate these two verses more or less as above. But the Greek does not say this at all. The Greek word translated 'knows' is oiden . This is the 3rd person singular perfect tense of eido, which means 'I see' like the Latin 'Video'. The perfect tense is used for completed actions in the past. So oiden literally means 'he has seen' . Now either this Greek word 'oiden' is in the present tense or it is in the past tense. What this means is that: 'Concerning that day or the hour nobody knows' is a linguistically possible sense of the Greek, and this is where the confusion has arisen. But it is not what the Greek actually says, no, the exact literal translation is: 'Concerning that day or the hour nobody has seen (with his mind)' this being meant in the sense of 'Concerning that day or the hour nobody has known.' Young's Literal Translation of the bible has: 'Nobody has known', and ironically the Greek Interlinear Translation of the Watchtower, the Kingdom Interlinear Translation has 'Nobody has known'! 32 And concerning that day and the hour, no one hath known, no even the messengers who are in the heaven, not even the son, except the father (Mark 13 - Young's Literal Translation). 'No one has known', or 'Nobody has seen' has a whole different connotation from 'no one knows' or 'nobody knows', because it is actually saying 'nobody has known in the past'. So with the exact translation, it is evident that Jesus was simply saying that no creation had yet been granted a knowledge of the day or the hour from time indefinite up to that time, which was Nisan 11, 33 CE. In any event these two scriptures, seeing as they are written in the past tense cannot be a prohibition on future knowledge of that 'day' and that 'hour'. Jesus likewise did not know the date of Armageddon, which is the date of his marriage to his new covenant bride until he had proposed to them on 33Nisan14. This is why he said what he did on 33Nisan11. 7 The sovereign Lord Jehovah will not do a single thing without revealing his confidential matter to his servants the prophets (Amos 3). Obviously at Armageddon God does quite a few very important things and the timing of these things is a confidential matter of his. And God is one who reveals such confidential matters to his servants the prophets. Every Witness knows that Daniel Chapter 4 has a greater meaning wherein the phrase '7 Times' is taken a day for a year and so means 2520 years. But very few witness have asked this question: If Daniel 4 has a greater meaning wherein the phrase '7 Times' means 2520 years, then what about other chapters in the bible which contain the phrase '7 Times'? Might they not have greater meanings as well? This was the question that the president of the Lords' Witnesses asked in 1992. He found the following phrase in Genesis Chapter 4. 15 At this Jehovah said to him: For that reason anyone killing Cain must suffer vengeance 7 Times. And so Jehovah set up a sign for Cain in order that no one finding him should strike him (Genesis 4). Well, would you look at that? One thing we know about God is that his justice is soul for soul. It is not soul for 7 souls. So anyone killing Cain has to suffer vengeance for 7 Times, which is 7 years in the literal meaning. Now the vengeance for killing a soul is to be killed yourself, since God's justice is soul for soul. So for a period for 7 years anyone killing Cain was to be killed himself. Cain was actually banished from the ground for 7 years, he was excommunicated from Adam's family for that period for killing his brother Abel and for being unrepentant at having deliberately offered the wrong sacrifice. 11 And now you are cursed in banishment from the ground, which has opened its mouth to receive your brother's blood at your hand. 12 When you cultivate the ground, it will not give you back its power. A wanderer and a fugitive you will become in the earth (Genesis 4). So for the entire period of his excommunication he was protected by the decree that if anyone should kill him that person would himself be killed. That was the literal meaning of the sign for Cain. But what about the greater meaning? Take Cain (a murderer from God's people) to be God's people, and the banishment to be their period outside a promised land (be it Eden or Canaan) and take 7 times to be 2520 years and you have the Exedenic Times. So just as Cain was banished from the family land/ground of Adam and consigned to a land which would not give him its true productive power for 7 years, so God's official people were banned from Eden and evicted into a land growing them thorns and thistles for 7 Prophetic Times or 2520 years (7x360 years) until they entered into the promised land, flowing with milk and honey in 1473Nisan. Now in the case of Ezekiel's actions as a prophet in Ezekiel 4:1-12, we know that each day of his literal actions stood for a year in the real fulfillment on God's people. This was part of the basis for the Times Principle. So applying the Times Principle of the code, we know that in the greater meaning 7 years become 7 Prophetic Times or 2520 years. Well Cain was the archetypical murderer of his brother and the archetypical false worshipping human, having deliberately offered the wrong sacrifice to God - see U47. So he would stand for false worshipping jealous murderers. The penalty on these people in the days of Cain and in fact in the days of Abraham, was that they should be banished from the ground, the true administration of God's people for 7 years. This did not change until the Law of Moses, which stipulated that they should be stoned, something that could not be done to Cain. But just as God's people are not really interested in who is the King of Babylon and in how long he has to spend as a wild animal in the forest, but rather they are interested in who is the King over God's people and how long do they have to wait until he starts reigning, so God's people are not interested in what kind of penalty Cain got for his murder, but rather in how long they will have to wait until they get a New Promised land and a set of laws that stop people murdering each other. For in fact God's people have always had three blessings, a kingship, a priesthood and a promised land. In Eden these were the Garden itself and the tree of life and the tree of knowledge of Good and Bad, which represented God's authority, his one law in Eden (don't eat from this tree). In Israel, they had the Davidic Kings, the Aaronic priests and the promised land. So we should look at the Gentile Times, which was a 7 Prophetic Times Kingship malediction, as just one member of a group of 3 blessings which can be removed. In other words the existence of a 7 Prophetic Times Kingship malediction means that we should also be looking out for a 7 Prophetic Times Priesthood malediction and a 7 Prophetic Times Promised Land malediction. By 7 Prophetic Times, we mean 2520 years. Now the Law of Moses came into force on 1513Sivan3 at mount Sinai in Arabia. But all the sons of Israel were condemned to death in the wilderness except Joshua and Caleb, the two faithful spies, and the sons of those condemned to death were not circumcised in the wilderness. In fact the sons of the wilderness were circumcised in Gilgal in the promised land on 1473Nisan15. So this is when the law of Moses came into force as regards the death penalty. So this was the end of the law of 7 year Banishment and of Vengeance on those who would kill killers. The Law of Moses required killers to be killed rather than being banished and protected. For more details on this please see U133. Now if we count back 2520 years or 7 Prophetic Times from the first day that they ate fruit of the promised land, from 1473Nisan15, the day that the sons of Israel went under law in the promised land through the circumcision, we get 3993Nisan BC. So that would be when the law of 7 year Banishment would have begun, since God is not lawless, and every system has laws on how to deal with murderers. God did not make up a banishment penalty just for Cain when he murdered his brother. Although it appears he made up a protection for him to stop anyone adding their own death penalty to Cain's 7 year Banishment penalty! So 3993Nisan would be when Adam and Eve first went under the new legal system outside Eden. So they were evicted from Eden in 3993Nisan. And their children spent 7 Prophetic Times outside of a promised land, and then after 2520 years they entered the promised land. We are saying that there are 7 Prophetic Times between Eden and the Promised land, this being a 2520 years Land Malediction, which we call the Exedenic Times. But we know that the Kingdom of God starts 6,000 years after the eviction from Eden, which is 6,000 years after 3993Nisan BC, which is 2008Nisan AD. QED. For an accurate explanation of the 7 Prophetic Times of the Gentile Times using the correct chronology for the fall of Jerusalem which did not occur in 607 as the Watchtower contends, but rather occurred in 586 BC, see U120 and U123. For an explanation of the 2520 year priesthood malediction which we call the Alienation Times, see U128 and U129. Jesus died in the exact centre of the First Abrahamic Covenant, the mid point between its inauguration and the start of the Kingdom of God in heaven and over the LWs and Laodicea, the last day of entry into the 1AC. Some religions believe that the First Abrahamic Covenant of Genesis 12 lasts into the Kingdom of God. Well it is true that its blessing, which is to be a citizen of the Kingdom of God, continues through the kingdom of God, but it is not possible to enter into the covenant once the Kingdom of God has started. For it is a covenant of faith. The sons of the 1AC (First Abrahamic Covenant) are the sons of the faith of Abraham. They must put faith in a kingdom that has not yet arrived. 12 and a father of circumcised offspring, not only to those who adhere to circumcision, but also to those who walk orderly in the footsteps of that faith while in the uncircumcised state which our father Abraham had (Romans 4). And faith is the evident demonstration of realities which are not beheld (Hebrews 11:1). So once they are beheld, faith is no longer necessary to see them! So once the kingdom becomes visible it is certainly too late to join the 1AC. But since the kingdom did not come with striking observableness (Luke 17:20), there is a period after it has started when you still need faith, but actually it is too late to join the 1AC. This is because Abraham crossed the Euphrates leaving the land of the Chaldeans, the land of Babylonia and entering the promised land through water. He stopped getting wet when he set foot on the promised land of Greater Canaan, on the other side of the Euphrates. So once we enter the Kingdom of God, we can no longer enter into the 1AC (First Abrahamic Covenant). We all enter the 1AC through a water baptism conducted by the angels. They baptise us as a result of our faith not necessarily in Jesus, but in God. Symbolically Chaldea is the world, and the promised land is not Canaan but is the kingdom of God. The Euphrates is the baptism into the 1AC and Abraham is himself and his 1AC progeny. All of these enter the Euphrates from Chaldea, the world, not from Canaan, the promised land. So entry to the 1AC must be from the world, so that entry ended at the end of the world. That is the bad news. The good news is that 50% of mankind had been baptised by the angels by then. These ones are the sheep whom Jesus will separate and rapture from Zoar. The Hebrew and Greek words: $wt and brq and mesw: all mean: midst, middle, centre, mid-point among or within depending on the context. When preceded by 'in', they mean 'in the midst of'. 45 And I will tabernacle in the midst ($wt) of the sons of Israel, and I will prove to be their God. 46 And they will certainly know that I am Jehovah their God, who brought them out of the land of Egypt that I may tabernacle in the midst ($wt) of them. I am Jehovah their God (Exodus 29). Here, God resides among the sons of Israel in the Tabernacle, the first moveable temple of God. 2 In the midst (brq) of the years Oh bring it to life! In the midst (brq) of the years may you make it known (Habakkuk 3). In the middle of a period of years, something is resurrected, something is made known! 15 A prophet from your own midst (brq), from your brothers, like me, is what Jehovah your God will raise up for you ......... 18 A prophet I shall raise up for them from the midst (brq) of their brothers, like you, and I shall indeed put my words in his mouth (Deuteronomy 18). This prophet was Jesus, he was raised up in the middle of his brothers! 27 I am in your midst (mesw) as the one ministering (Luke 22). 26 John answered them, saying: I baptize in water. In the middle (mesoV) of you one is standing whom you do not know (John 1). 9 Do not presume to say to yourselves, as a father we have Abraham. For I say to you that God is able to raise children to Abraham from these stones (Matthew 3). John meant that God can make children of the faith of Abraham, sons of the 1AC, from the stones of the church, who can baptise people in water as John did. The stones of a Christian church are not made of rock but are humans who if sanctified in holy spirit are living stones, and if merely water baptised, are dead stones. But everyone in the church is a stone! And every church stone can make children to Abraham. This procreative capability is in fact the very definition of a true Christian religion. So John tells us that Jesus stands in the middle of the sons of the 1AC. And Habakkuk tells us that, 'in the midst of the years' something is brought to life and something is made known. Well Jesus was brought to life and God’s plan for salvation was made known by him, so he is the ‘something’. So Jesus was resurrected and he made something known in the middle of a period of years to do with the sons of the 1AC. Plainly these years are the years of the 1AC. The climax of Jesus’ ministry, was his death, and in fact Jesus died in the middle of the years of the 1AC. Of course he was raised 3 days later inclusively. But Habakkuk said in the midst of the years bring it to life, so he was speaking in years not in days. Now we know that the 1AC started in 1943Nisan, when Abraham Crossed the Euphrates, and that Jesus died and was resurrected in 33 Nisan, precisely Hebrew 1975 years later. So Armageddon is a further 1975 years after Jesus' death, i.e. 2008Nisan. But we know that Immanuel, who was Jesus, the 30 year old non adamic human, was transferred so as not to see death at his baptism on 29Tishri10, with the entrance of Michael. His body, a slave’s form, was taken and used by Michael during his ministry. It became the validation sacrifice for the 1AC - see I29. Jesus died 3½ years after his baptism on 33Nisan14. This was when his fleshly body validated the 1AC. His angelic body validated something much greater, ransoming Adam's angelic body, see I28. We know that the Jews left Egypt on 1513Nisan14 for the promised land, so it would be likely that Abraham left Mesopotamia for crossing the Euphrates into greater Canaan, the promised land, 430 years earlier on the same day, since we know it was the same month, that would be 1943Nisan14. So since we believe in the perfection of God, we trust that his Midst Prophecy will be exact to the day of the BLC. Now since Abraham crossed the Euphrates on 1943Nisan14, and since Jesus died on 33Nisan14, we deduce that entrance into the 1AC ends on 2008Nisan14, which is the last day of the world. If we look at the First Abrahamic Covenant from the Solar Calendar (Gregorian) point of view we have 1943Nisan14 being April10 and 33Nisan14 being March31 and 2008Nisan14 being March21. So each half of the covenant is 1975 Solar years less 10 days. So Jesus died in the middle of the Abrahamic covenant to the day, as measured both by the BLC and the Gregorian (True Solar) Calendar!! We extend the Gregorian calendar backwards to 1943BC. It is just a true solar calendar. God kept the 1AC in force for one more week, from 2008Nisan15-21, the covenant for the many of Daniel9. To get a true Solar calendar BC, since there was no 0BC, we take 1BC as 0, and 101BC as -100 etc. So we just move the leap years one year back BC. 25 Also, there will be signs in sun and moon and stars, and on the earth anguish of nations, not knowing the way out because of the roaring of the sea and [its] agitation (Luke 21). So Jesus' death is dead centre of the 1AC as measured by the Biblical lunar Calendar and as measured by a true Solar calendar. That is astonishing. Presumably there is some astral centredness going on here too?? To download the BLC and check this for yourself - see Download. The Metonic cycle (discovered by the Greek mathematician - Meton) reveals that every 19 years, lunar and solar cycles/calendars coincide. In the table above we have 3 in 50 years (i.e. 1 in 16.666 years). But we started with a coinciding day so this pretty much confirms Meton's theory. So the Passover will be central in both the lunar and the solar calendars around 1 in every 19 years. So there was a 1 in 19 chance of that happening in the middle of the years of the Abrahamic Covenant and it did. So the end of the world is 2008 March 21st. Actually the Kingdom of God starts on the 3rd day counting inclusively, as in the case of all system changes of God, this being 2008 March 23rd. And Armageddon is the first 150 days of the Kingdom of God - see U154, U163. For the Kingdom of God is the 1,000 year 'day' of destruction of ungodly men and judgement of many of those who enter it. 7 But by the same word the heavens and the earth that are now stored up for fire and are being reserved to the day of judgment and of destruction of the ungodly men. 8 However, let this one fact not be escaping your notice, beloved ones, that one day is with Jehovah as 1,000 years and 1,000 years as one day (2 Peter 3). So: Cry out shrilly and shout for joy! Oh you inhabitress of Zion, for great in the MIDST of you is the Holy one of Israel (Isaiah 12:6). The ransom of Jesus did not correspond with 'all ones' for a ransom is soul for soul. So it corresponded with Adam. But how did Jesus' ransom correspond with Adam? So the correspondence is not judicial, because the ransomer had more to give than the ransomee had to lose. We used to think that in some way Jesus had to resist sin for the same period of time that Adam lived before he sinned but there is no judicial significance to the length of time Jesus resisted sin for at all. He could have ransomed Adam on the first day of his ministry or 1,000 years later, a payment is a payment and a ransom is a ransom. So really is Adam is going to correspond to Jesus temporally he must have had a corresponding life course. So Jesus’ life up to his ransom corresponded temporally with Adam's up to his sin requiring a ransom. Now Jesus died 33½ years after he was born. So Adam sinned 33½ years after he was born. It is as simple as that. This temporal correspondence acts as a witness to Jesus' life being a ransom for Adam. This we shall see gives us another way to calculate the date of Armageddon. Now the society have Adam as being born in '4026 BC'. But before the calendar was changed at the Passover in the days of Moses, the year ran from Tishri to Tishri, not Nisan to Nisan. We know this because the ancient bible calendar (before the flood and before the Exodus) started then, and in fact all very ancient calendars started in Tishri because this was when Adam was born - see Ancient Calendars - U90. Now if you count back very carefully from Noah to Adam you find that Adam was born in the Old Hebrew Year, the BLC year from 4027Tishi to 4026Elul - see U96. So actually since he was born in Tishri, he was born in 4027Tishri. So he sinned 33½ years later in 3993Nisan. So Armageddon is 6,000 years after that, i.e. it is in 2008Nisan. Jesus was born in Tishri and died in Nisan. So let us now credit our brilliant God with the perfection Moses declared he had, shall we? 4 The Rock, perfect is his activity, for all his ways are justice (Deuteronomy 32). 2008Nisan14 is March 21st, 2008 which is the Vernal Equinox in that year. It is quite rare for the Passover to be co-incident with the Vernal Equinox (when night and day are the same length as day overtakes night). 38 And in the 11th year, in the lunar month of Bul [Heshvan], that is, the 8th month, the house was finished as regards all its details and all its plan; so that he was 7 years at building it (1 Kings 6). 2 So all the men of Israel congregated themselves to King Solomon in the lunar month of Ethanim [Tishri] in the festival, that is, the 7th month. 3 So all the older men of Israel came, and the priests began to carry the Ark. 4 And they came bringing up the ark of Jehovah and the tent of meeting and all the holy utensils that were in the tent; and the priests and the Levites came bringing them up (1 Kings 8). The first regnal year of Solomon was 1036, the 11th was 1026. The temple was fully functional in 1026Heshvan and inaugurated the month before in 1026Tishri. Had it not been ready in the 7th month then it would have been inaugurated at the Passover. But this did not occur so it must have been ready then. Every temple is commissioned 22½ years before it is inaugurated, see U41. This is why Jesus was in the temple teaching the Pharisees aged 11, 22½ years before he died and completed the temple worship system of the living stones of the body of his wife, the 1NC saints. With a physical temple you need to get all the stones in place before you start worshipping in it. With a spiritual temple, you start worshipping once you have a foundation cornerstone. The worship is actually the construction of the temple! So Solomon was commissioned to build his physical temple in 1048Nisan, 22½ years before 1026Tishri when it was inaugurated. There is another really cute proof that David purchased Ornan's threshing floor and Solomon was commissioned to build his temple in 1048Nisan and it is this. 10 Go, and you must speak to David, saying: This is what Jehovah has said: There are 3 things that I am directing against you. Choose for yourself one of them, that I may do it to you. 12 whether for 3 years there is to be a famine; or for 3 months there is to be a sweeping away from before your adversaries and for the sword of your enemies to overtake [you], or for 3 days there is to be the sword of Jehovah, and/even pestilence [properly destruction/death - Gesenius], in the land, with Jehovah's angel bringing ruin in all the territory of Israel.' And now see what I should reply to the One sending me (1 Chronicles 21). 3 possible punishments all of which David and his sons actually suffered - see U40. Each penalty involves the concept of 3 times, be they 3 days, 3 months or 3 years. This is the Holy Spirit getting cryptic with us. The whole thing is a witness to 3 Prophetic Times, or 3 x 360 years, which is 1080 years. These years run from 1048Nisan, when David purchased the threshing floor of Solomon's temple from Ornan to 33Nisan when Jesus purchased and laid the foundation stone of the temple of the body of his wife, by dying sacrificially. We call this period of 1080 years the Temple Times. 1 And Satan proceeded to stand up against Israel and to incite David to number Israel. 2 So David said to Joab and the chiefs of the people: Go, count Israel from Beer-sheba to Dan and bring it to me that I may know their number. 3 But Joab said: May Jehovah add to his people a hundred times as many as they are. Do they not, O my lord the king, all of them belong to my lord as servants? Why does my lord seek this? Why should he become a cause of guilt to Israel? 4 The king's word, however, prevailed over Joab, so that Joab went out and walked through all Israel, after which he came to Jerusalem. 5 Joab now gave the number of the registration of the people to David; and all Israel amounted to 1,100,000 men drawing sword, and Judah 470,000 men drawing sword (1 Chronicles 21:1-5). 16 When David raised his eyes, he got to see Jehovah’s angel standing between the earth and the heavens with his drawn sword in his hand extended toward Jerusalem (1 Chronicles 21). 26 Then David built there an altar to Jehovah and offered up burnt sacrifices and communion sacrifices, and he proceeded to call upon Jehovah, who now answered him with fire from the heavens upon the altar of burnt offering. 27 Moreover, Jehovah said the word to the angel, who accordingly returned his sword to its sheath (1 Chronicles 21). Now Joseph has told us that 7 cows stand for 7 years. And he has told us that 3 baskets of bread stand for 3 days in the case of inspired dreams. But is the whole bible not an inspired dream in the sense that inspired writing comes not only from the conscious mind but also from the subconscious mind which God works upon to give the writing, since we are certainly not conscious of how he inspires us? So a dream comes from our subconscious and so does inspired writing. So here is another aspect of the bible code. number of animals of number of things can stand for time periods. So what about 1.1 million men drawing sword then? What time period might they represent in the greater meaning of 1 Chronicles 21. For who are we having given Daniel 4 and Genesis 4 a greater meaning, to deny the same prophetic power to the writings of Samuel? So we now apply the Numerical Principle of the bible code to these 1.1 million men of Israel drawing sword. They are 1.1 million days or 3055 years 200 days of men drawing a sword for God (the bible). This is 1.1 million days of Abrahamic seed. But we know that the Abrahamic covenant ends (as regards entrance into it) on 2008Nisan14. This is 3055 years precisely after 1048Nisan14 when the census was completed and so the 3 day plague began. That's what we call symbolism! A man drawing sword for a day of entering the 1AC. But that leaves us with this extra 200 days. Well actually not quite. Because David purchased the temple floor on 1048Nisan16 (3 Prophetic Times of the temple times before 33Nisan16 when Jesus purchased the temple floor of TCC1 with his angelic soul. And the Kingdom of God began on 2008Nisan22, first fruits day after the interposing Sabbath on 2008Nisan21, and the marriage of Jesus to the 3rd holy spirit, the heavenly 1NC Kings. So entrance to the 1AC ended on 2008Nisan21, which is 3055 years and 5 days after 1048Nisan16 BC. So that leaves 195 extra days of 1AC entrance which run from 2019Iyyar27, to 2019Chislev11. Now Abraham negotiated with God for 50 hypothetically righteous ones and 45 and 40 and 30 and 20 and 10. But 50+45+40+30+20+10=195, a day for a hypothetically righteous one. Zoar needs the 1AC again once the water baptism of TCC4 ends, i.e. when Lot's wife gets dehydrated into a pillar of salt. The 470,000 men of Judah, are 470,000 days or 1305 years 200 days. They count backwards to 2354Elul26/27 BC when the first separation between good and bad seed, 16 years after the flood occurred, incited of course by Satan, as was the registration. The bible describes how Canaan abused Noah's nakedness in some way and how Ham, looked upon his father Noah’s nakedness and told his brothers. Whereas Shem and Japheth covered their father’s nakedness by walking in backwards with a mantle into the tent where the naked intoxicated Noah lay without looking. Ham did not honour his father. The other two sons did (Genesis 9). The final saint to be registered for honouring his father God is 470,000 plus 1,100,000 days later. So in the symbolic meaning, the greater registration is of the time period of the entrance of faithful seed into a salvation covenant from when the first distinction between the true and the false seed was made in Noah’s tent, until the last faithful person enters into the 1AC on 2008Nisan21, (the last day of Cakes symbolising the end of an escape from Adam into Abraham) and then an extra 195 days for Zoar from 2019Iyyar27 to 2019Chislev11. First post flood guy enters the SFC 1,100,000 of Israel start It stops 195 days short. Last chance saloon for those sealed into the FRC These sons of the 1AC can be sealed into the FRC up until 2019Adar30=2020Nisan6. Once David had built an altar on the threshing floor, and offered a sacrifice, then God sent fire down from the heavens to consume it. 22 Finally Pharaoh commanded all his people, saying: Every newborn son you are to throw into the river Nile, but every daughter you are to preserve alive (Exodus 1). This command was from Satan as can be seen more directly from Revelation 2, where he does it again! 15 And the serpent disgorged water like a river from its mouth after the woman, to cause her to be drowned by the river. 16 But the earth came to the woman's help, and the earth opened its mouth and swallowed up the river that the dragon disgorged from its mouth (Revelation 2). 2 And the woman became pregnant and brought a son to birth. When she saw how good-looking he was, she kept him concealed for 3 lunar months. 3 When she was no longer able to conceal him, she then took for him an ark of papyrus and coated it with bitumen and pitch and put the child in it and put it among the reeds by the bank of the river Nile (Exodus 2). So this period of concealment must have started after the midwives were ordered to kill the baby boys. And it must have ended after the people were commanded to drown them. We know that Moses was born in 1594Adar, so the period ended in 1593Sivan. So the command to drown baby boys occurred between 1594Adar and 1593Sivan. 19 This one used statecraft against our race and wrongfully forced the fathers to expose their infants, that they might not be preserved alive. 20 In that particular time Moses was born, and he was divinely beautiful. And he was nursed three months in [his] father's home. 21 But when he was exposed, the daughter of Pharaoh picked him up and brought him up as her own son (Acts 7). 9 Pharaoh's daughter then said to her: Take this child with you and nurse him for me, and I myself shall give you your wages. Accordingly the woman took the child and nursed him (Exodus 2). 7 And your father has trifled with me and he has changed my wages 10 times, but God has not allowed him to do me harm (Genesis 31). 41 This makes 20 years for me in your house. I have served you 14 years for your 2 daughters and 6 years for your flock, and you kept changing my wages 10 times (Genesis 31). 30 I shall not speak much with you anymore, for the ruler of the world is coming. And he has no hold on me (John 14). 7 But Er, Judah's firstborn, proved to be bad in the eyes of Jehovah; hence Jehovah put him to death (Genesis 38). This account is written as if the true God just kills guys who are bad. Nothing could be further from the truth. Satan is still alive is he not? Cain was not put to death as a result of his murder was he? There is no son of Jacob recorded as being killed by any outsider until the command of Pharaoh. So we now interpret these 10 Prophetic Times as 3,600 years during which Satan's seed are killing Abraham's true seed. This period starts between 1594Adar and 1593Sivan and ends at Armageddon. So Armageddon must be between 2007Adar and 2008Sivan. These are the 10 Times of Pharaoh's Times. In fact we know that the last member of Abraham's true seed to be killed by Satan dies on 2008Nisan14, since Satan himself loses all authority to rule or to kill on that day. So from this we can tell that the first baby boy to drown in the Nile, died in 1593Nisan. But look! 3,600 years after Satan started killing God's people, Abraham's seed, in Egypt, in 1593Nisan, Michael, the passover angel, will kill all of Satan's people, his seed, at Armageddon after 2008Nisan. This is a kind of payback from Jehovah. 2 Now the wild-beast that I saw was like a leopard, but its feet were as those of a bear, and its mouth was as a lion's mouth. And the dragon gave to [the beast] its power and its throne and great authority. 3 And I saw one of its heads as though slaughtered to death, but its death-stroke got healed, and all the earth followed the wild-beast with admiration (Revelation 13). 1990 November 29, 1990Chislev8, UN Security Council Resolution 678 Authorises all member states to use: All necessary means to uphold and implement resolution 660 and subsequent resolutions to restore international peace and security in the area of Kuwait. 1991 March 2, 1990Adar11, UN Security Council Resolution 686: Relating to the suspension of combat operations and the importance of Iraq taking measures to end definitively the hostilities. 1991 April 3, 1991Nisan18, UN Security Council Resolution 687 Relating to the Restoration of Sovereignty, independence and territorial integrity to Kuwait and the return of its legitimate government, and to the status of sanctions. 2002 July 1, 2002Tammuz18, The ICC is established, giving the UN power over military personnel of every nation of the earth whilst these troops are operating in a nation which has signed up to it (The US and Israel have not yet). But their troops are subject to it, if they are operating in a nation which has signed up to it. 2002 July 1/2, 2002Tammuz19, The first regnal day of the UN, through the UNICC. Its first day of judicial authority over all the world's military. The US accepted its authority, but negotiated an exemption for a year. The law maker behind the UNICC is the UN. Kings make laws. So the UN became the world's military king through the UNICC on 2002July1. 2002 July 12, 2002Tammuz30, US backs down. They agree to the jurisdiction of the ICC effective in one years time unless the UN security council votes against it. Of course the UN security council can always vote against it at any time. Security Council Resolution SC7540. 2003 Tuesday March 18th, 2002Veadar9, GW Bush gives Saddam a 48 hour ultimatum. No UN authority for such an ultimatum. This is the beginning of the sword stroke to the second head, the second year of headship, of the UN Beast. 2003 Thursday March 20th, 2002Veadar11, the War on Iraq starts. The sword stroke (unauthorised war on Iraq) is delivered to the UN Beast by the two horned UK/US beast. 2003 May 22, 2003Iyyar19, UNSC resolution 1483 legitimizing the coalition as the occupying power in Iraq. The US/UK by asking for and by accepting the UN authorization, have now accepted the UN as their authorizer, and so have given their authority to the UN. Also the second head of the UN (which runs from 2002Tishri to 2003Elul) has now recovered from the sword stroke. 3 While he was sitting upon the Mount of Olives, the disciples approached him privately, saying: Tell us, When will these things be, and what will be the sign of your presence and of the conclusion of the system of things? 5 for many will come on the basis of my name, saying, 'I am the Christ,' and will mislead many. 6 you are going to hear of wars and reports of wars; see that you are not terrified. For these things must take place, but the end is not yet. 7 For nation will rise against nation and kingdom against kingdom, and there will be food shortages and earthquakes in one place after another. 8 All these things are a beginning of pangs of distress. 9 Then people will deliver you up to tribulation and will kill you, and you will be objects of hatred by all the nations on account of my name. 10 Then, also, many will be stumbled and will betray one another and will hate one another. 12 and because of the increasing of lawlessness the love of the greater number will cool off. 13 But he that has endured to the end is the one that will be saved. 14 And this good news of the kingdom will be preached in all the inhabited earth for a witness to all the nations; and then the end will come. 16 then let those in Judea begin fleeing to the mountains. 21 for then there will be great tribulation such as has not occurred since the world's beginning until now, no, nor will occur again. 22 In fact, unless those days were cut short, no flesh would be saved; but on account of the chosen ones those days will be cut short. 23 Then if anyone says to you, 'Look! Here is the Christ,' or, 'There!' do not believe it. 24 For false Christs and false prophets will arise and will give great signs and wonders so as to mislead, if possible, even the chosen ones. 25 Look! I have forewarned you. 26 Therefore, if people say to you, 'Look! He is in the wilderness,' do not go out; 'Look! He is in the inner chambers,' do not believe it. 27 For just as the lightning comes out of eastern parts and shines over to western parts, so the presence of the Son of man will be. 28 Wherever the carcass is, there the eagles will be gathered together. 31 And he will send forth his angels with a great trumpet sound, and they will gather his chosen ones together from the 4 winds, from one extremity of the heavens to their other extremity. 32 Now learn from the fig tree as an illustration this point: Just as soon as its young branch grows tender and it puts forth leaves, you know that summer is near. 33 Likewise also you, when you see all these things, know that he is near at the doors. Matthew 24:1-25:46 and Mark 13:1-37 and Luke 21:5-38 are parallel accounts of the same events. The disciples asked Jesus 4 things. Matthew asks 1,2 and 3. Mark asks 1 and 4. Luke asks 1 and 4. But since these are parallel literal accounts of the same events, all 4 questions were asked of Jesus and the answer given by Jesus, was in fact all three answers, which apply to all 4 questions. But the end of the Jewish system of things physically caused by Titus in 70 CE lies in the first presence, and the end of the world, caused by corrupt politicians, lies at the end of the second presence. So really Jesus is being asked: What sign (singular) is the sign of your first presence which contains the end of the Jewish system, and is also the sign of your second presence which ends with Armageddon. All three answers in Matthew Mark and Luke, apply to the first presence containing the end of the Mosaic system and to the second presence which ends on the last day of this world and is followed by Armageddon which is the total conclusion of this age. So not only will there be earthquakes and physical famines at the end of the world (of which we are already seeing in increasing numbers), but Jerusalem, the city in Israel on the West Bank, will be surrounded by encamped armies, and when it is, the inhabitants thereof with faith in God (be they Arab, Jew, Christian or Muslim) are advised to flee to the mountains yet again. Now Jesus said in answer that: 'this generation will by no means pass away/come beside/arrive until all these things occur'. He was literally referring to the generation alive at the time he told them about these signs. This generation survived until the end of the Jewish system of things, and they survived until John received the Revelation. They actually survived until the end of the first presence which was in 136Tishri, see I45. The generation referred to by Jesus in Matthew 24, was the one that rose nation against nation to fight in WW1, for that war was the first world war and occurred near the beginning of the second presence of the Christ which started in 1889Sivan11 - see U33. Now in order for the words of Jesus to be a real sign and for them to have power as every scripture must (see Hebrews 4:12) one must be able to count those in that generation. For this reason that generation had to be the combat veterans of WW1. Since these veterans are counted and documented. Now the second presence ended on 2013Chislev11 and the last combat veteran of WW1, who was Claude Choules died on 2011May15=2011Iyyar1/2, whereas the last one to rise up and volunteer was Florence Beatrice Green, who died on 2012February4 (2011Shebat6/7). The last US WW1 veteran, Frank Buckles survived until 2011February27 = 2010Adar17/18. Violet Brown was the 2nd last SuperCentenarian born before 1900November11 in a WW1 participating country to die. She died on 2017September15 and was born on 1900March10. Nabi Tajima was the last SuperCentenarian born before 1900November11 in a WW1 participating country, to die. She died on 2018April21 and was born on 1900August4. They both lived past the end of the 2nd presence. So the generation old enough to volunteer did survive past the end of the 2nd presence on 2013Chislev11. On October 31st 1517 (Julian Calendar) which was November 10th 1517 Gregorian and 1517Heshvan13 BLC, Martin Luther nailed the 95 Theses of his dissertation against indulgences to the door of the castle church in Wittenberg and sent a copy to the Archbishop Albert of Mainz. These in their final fulfilment, end with the last day of this system, on 2008Nisan14. So they begin 70 sevens of years or 490 years earlier in 1518Nisan. But this month was the first month of the first calendar year after Martin Luther started the Reformation with his 95 theses. 25 From the going forth of the word to restore and to rebuild Jerusalem until Messiah, Leader, there will be 7 sevens and 62 sevens. 26 And after the 62 sevens Messiah will be cut off, with nothing for himself. 27 And he must keep [the] covenant in force for the many for one seven; and at the half of the seven he will cause sacrifice and gift offering to cease (Daniel 9). Now the covenant for the many that is kept in force for the week, for the seven, must be the 1AC, because other all other covenants are for the few. Also 'your people' in verse 24 are the sons of the 1AC, since there was no valid water baptism at the time of Martin Luther. The 1AC ends on 2008Nisan14 as regards entrance into it. It ceases to be a means of salvation for new people on that day. So the last week of that covenant runs from 2001Nisan to 2008Nisan. If the 95 theses, which kicked off the famous 'Reformation', were in fact the word to restore and rebuild Jerusalem of Daniel 9, then 69 weeks or 483 whole BLC years would take us to 2001Nisan. But the last year of the 483 years, 2000Nisan - 2001Nisan is the year that the congregation of the LWs began, by virtue of Gordon's baptism of Tony in 2000Elul and then of Jamie in 2000Tishri. Now one cannot be a leader with no congregation. So Gordon became a leader of a congregation in 2000Elul, in the 483rd whole calendar year after Martin Luther started the protestant reformation. He became the leader of the LWs, 69 weeks of years, or 483 years after the reformation began, counting inclusively. Now if you read verse 26 and verse 27 of Daniel 9 you see that Jesus was to be cut off with nothing at some unspecified time after the 69 weeks, in fact at some unspecified point in the 70th week. And then that gift offering and sacrifice would be stopped by God at the half of the last week. Now in fact in the fulfilments in Jesus' day of verse 26 and verse 27 were coincident. But they are in different verses because in another time period their fulfilments will not be co-incident. Furthermore the first century fulfilment with Jesus was accurate to the month. But Daniel 9 does not require such accuracy. It could also be fulfilled accurate to the year. In fact the ambiguity principle of the code states that if a scripture is ambiguous then this is not an oversight by the holy spirit, it is deliberate. And the scripture is deliberately trying to say both things and therefore both possible meanings will have force. So if Jesus fulfilled Daniel 9 accurate to the month then some other Leader will fulfill it accurate to the year, not accurate to the month. And Gordon became leader of the LWs 483 years after Luther nailed his 95 theses to the church door. The half of the week is the mid-year of the last 7 years. This is the year from 2004Nisan to 2005Nisan. Now during this year, in fact on 2004Elul14, the Watchtower became false religion losing its faith baptism, its 1AC capability. It lost this because it defiled its priesthood and chose people who did not claim to be 1NC saints to officiate at the altar. This lack of faith in the priests chosen by God was the placing of the abomination of Daniel 12, and was the end of the faith baptism of the Watchtower, which was the end of the Watchtower as a true church. At that time God terminated the meaning of any sacrifice or gift offering from any JW. And that ended the constant feature, since there were not enough LWs to make a constant feature at that time. We made more of a sporadic feature! Then the Messiah was cut off with nothing for himself in 2001Tishri, just after the 69 weeks of years, ended on 2001Nisan. He was cut off when the Watchtower lost its water baptism and so the 1NC saints were not clean in the flesh any longer and therefore not part of Jesus' wife. So Jesus' flesh was destroyed certainly by 2001Heshvan14, the date that the abomination causing desolation to FDS3 of the library card letter to the Bethels of 2001Heshvan10/11, was placed (received and digested). The lack of repentance in that letter for placing the throne of Satan in the temple of God and for riding the UN beast as a harlot church by becoming an NGO associated with the UN Department of Information, ended the 3EC water baptism on that day. So it all works to the year, but not to the month. The word going forth to rebuild and restore Jerusalem, was the reformation which resulted from the 95 theses. Apparently some forward thinking German guy took a copy of the 95 theses and translated them into German and printed them up in thousands. That is what kicked off the protestant churches of today. Martin Luther then spent 1518 and 1519 defending his 95 theses. He was excommunicated by the pope in 1521 on January 3 Julian. 24 There are 70 sevens that have been determined upon your people and upon your holy city, in order to terminate the transgression, and to finish off sin, and to make atonement for error, and to bring in righteousness for times indefinite, and to imprint a seal upon vision and prophet, and to anoint the Holy of Holies [from 1518Nisan - 2008Nisan]. 25 And you should know and have the insight [that] from the going forth of [the] word to restore and to rebuild Jerusalem [95 Theses in 1517Heshvan] until Messiah, [the] Leader [Gordon starts leading the LW congregation in 2000Elul], there will be 7 sevens, also 62 sevens. She will return and be actually rebuilt, with a public square and moat, but in the straits of the times. 26 And after the 62 sevens Messiah will be cut off, with nothing for himself [Jesus on 2001Tishri30]. And the city and the holy place the people of a leader that is coming [the little horn/UN] will bring to their ruin. And the end of him will be by the flood [of angels at Armageddon following the chronology of the first flood]. And until [his] end there will be war [WW3, West against Islam]; what is decided upon is desolations [for the world and its governments]. 27 And he must keep [the] covenant [the 1AC] in force for the many for one seven [2001Nisan1-2008Nisan14]; and at the half of the seven [2004Nisan-2005Nisan in fact on 2004Elul14] he will cause sacrifice and gift offering to cease. And upon the wing of disgusting things there will be the one causing desolation [GNS2 is the one causing deoslation to the Watchtower]; and until an extermination [caused by the fire sings of 1Kings18 and the Great Tribulation and the 3 New Passovers], the very thing decided upon will go pouring out also upon the one lying desolate [the remnant, Jesus' wife] (Daniel 9). We know from the pattern of his life superposed upon the first true church of the second presence, the Watchtower, the Charles Taze Russell was water baptised from heaven as Elijah3 on 1871Heshvan21 (the 2NC Pentecost) and then spirit sanctified on 1889Sivan11 - see U42. Jesus is present through the flesh of his wife, the 1NC saints. These ones, being engaged to him through the new covenant, are one flesh with Jesus. So their bodies are his body. Their flesh is his flesh. 37 For just as the days of Noah were, so the presence of the Son of man will be. 39 and they took no note until the flood came and swept them all away, so the presence of the Son of man will be (Matthew 24). 3 After that Jehovah said: My spirit shall not act toward man indefinitely in that he is also flesh/they have erred. Accordingly his days shall amount to 120 years. (Genesis 6). Also after Moses the maximum lifespan for men was 120 years. Moses lived for exactly 120 years see section I15. So since Jesus is present through his fiancé, then this ‘woman’ should not live for more than 120 years as a human in each presence. This maximum lifespan is not just a deduction of ours from the scriptures, it is also an observation of the Jewish Historian Josephus, the contemporary of Jesus. For the life of man was already by degrees diminished, and became shorter than before, till the birth of Moses, after whom the term of human life was 120 years...(Antiquities of the Jews Chapter 6 paragraph 5). For more on the two presences of Jesus see I45. Furthermore Daniel 12 informs us that there is a 4½ year gap in the second presence - see U152. So the time from the beginning of the presence until its end is 124½ years. If we move forward 124½ years from 1889Sivan11, then we end up on 2013Chislev11, when Laodicea lost its water baptism. Let's start with Daniel 8. the key verses are 11-14. 11 And all the way to the Prince of the army [Jesus] it put on great airs, and from him the constant [feature] was taken away, and the established place of his sanctuary was thrown down [Antiochus attacked Jerusalem again and defiled the temple and set up the abomination causing desolation on 168Chislev15, putting an idol altar on the altar of the temple]. 12 And [the] army [sons of Israel and the 2AC] was given over, together with the constant [feature], due to transgression [The transgression causing desolation was wicked Jews who made covenants with the Greeks. This lead to a new unified world order of idolatry at the command of Antiochus]. And it kept throwing truth to the ground [hiding truth in its administration], and it acted and had success. 14 So he said to me: Until evening [and] morning 2300, and [the] holy place will certainly be brought into its right condition/restored [National idolatry at the written decree of Antiochus began in the 142nd year of the kingdom of Greece, the transgression starting on 171Elul29 (6th September 171) and the temple was restored and the altar rededicated by Judas Maccabeus on 165Chislev25 in the 148th year of the Kingdom of Greece over Israel, 2300 Solar days later] (Daniel 8). The 2300 evenings and mornings start with the transgression that causes desolation, and at some point during this period due to that transgression, the constant feature is removed. Throughout the period the holy place and the army and trampled on. The holy place is restored at the end of the period along with the constant feature. For more on the literal meaning see U157. But just as in the case of Daniel chapter 4, there is a greater meaning, in fact there are two greater meanings, one which applies in the first century and one which applies in the last days, i.e. 'today'. 11 And all the way to the Prince of the army [Jesus] it put on great airs, and from him the constant [feature] [sufficient true Christians so that some are always in true worship] was taken away [all of TCC1, the first true Christian Congregation, is disfellowshipped], and the established place of his sanctuary was thrown down [not a living stone left upon a living stone]. 12 And an army itself was given over, together with the constant [feature], due to transgression [Idolatary of Romans or Roman Gods, making an agrement with Rome and becoming the Roman Catholic Church], and it kept throwing truth to the ground [hiding truth in its administration], and it acted and had success. FDS1 is the first faithful and discreet slave of Matthew 24. FDS2 is the second faithful and discreet slave etc - see I46. When a FDS falls in authority over the saints it first becomes a WSS, a wicked and sluggish slave of Matthew 25. Then when it loses its water baptism it becomes a GNS, a good for nothing slave of Matthew 25. When a good for nothing slave is rejected by Jesus, the whole church becomes a false religion. That is the path from true religion to false religion. There are 4 True Christian Churches, 2 in each presence of the Christ, see I46. 26 It was first in Antioch that the disciples were by divine providence called Christians (Acts 11). What did the Romans ever do for us? They exonerated Jesus Christ! There is no abomination causing desolation in the evening fulfilment (the first one in the presence), and the Abomination causing desolation of Daniel 12 was to the temple of the law so does not apply to the morning fulfilment of Daniel 8 in the first presence which is the story of FDS1. FDS1 had the constant feature all through the vision period. 11 And all the way to the Prince of the army [Jesus] it put on great airs, and from him the constant [feature] [sufficient true Christians so that some are always teaching, evangelising or researching] was taken away, and the established place of his sanctuary was thrown down [not a living stone was left upon a stone]. 12 And an army itself [The sons and ex sons of the 3EC] was given over, together with the constant [feature], due to transgression; and it kept throwing truth to the ground [Hiding the truth within its administration], and it acted and had success. There were two sacrifices each solar day that made up the constant feature. If you like the Jews had to give God his breakfast and his dinner. For he was a member of their family. He was the head of their family. In this interpretation we take a solar day for a constant feature sacrifice, or if you like we take an evening for a day and a morning for a day. So the entire period of 2300 literal days, which was 4600 evenings and mornings (combined), or 4600 sacrifices represents 4600 solar days in this symbolism. 2300 Evenings and Mornings (First fulfilment, evening) 4600 Solar days from the resolution of the Federal Council of Churches (FCC) in the US to the League of Nations declaring them to be the political expression of the Kingdom of God on earth. To the first day of the Columbus Ohio Convention of the Jehovah's witnesses on 1931July24, during which they took the name Jehovah's witnesses. This name is only given when the sanctuary is restored and the constant feature is in place. 2300 Evenings and Mornings (Second fulfilment, morning) 4600 Solar days from the transgression causing desolation to FDS3 and the calculation by Gordon of the date of the end, to the restoration of the temple and the constant feature in FDS4 on 2004Elul16. FDS3 became a UN NGO on January 28th 1992. This was their transgression causing desolation to them. Gordon worked out the date of the end on 1991Shebat21 (1992 February 1st in the day), 4600 Solar days later is 2004September4 in the day (2004Elul16). This is the 3rd day inclusively after 2004Elul14, which is the day according to Daniel 12 (1290 days before 2008Nisan14), when the abomination causing desolation is placed in the temple of FDS3/GNS2, which removes the constant feature of true worship. FCC is the Federal Council of Churches. There is no abomination causing desolation in the first fulfilment (the evening fulfilment). The Watchtower had the constant feature all through this vision. Transgression causing desolation to FDS3 Army released to Satan, no longer true worshippers. There is a 4600 solar day period for FDS4 from the ' time of the end' to the right condition of the temple. There is a 4600 solar day period for FDS3, from their transgression that causes desolation, to the placing of the abomination that causes desolation on 2004Elul14 (a decision in the Watchtower which ended the priesthood of the 1NC saints, replacing them with a group of unsanctified false priest who cannot run a 1NC church). This was the end of the constant feature and the end of the Watchtower as a true religion. The temple of FDS4 is completed on the third day after the temple of FDS3 (which is by then the temple of GNS2) becomes a false religion. 19 In answer Jesus said to them: Break down this temple, and in three days I will raise it up. 20 Therefore the Jews said: This temple was built in forty-six years, and will you raise it up in three days? 21 But he was talking about the temple of his body (John 2). Charles Russell was water baptised in 1871Heshvan21 (the 2NC Pentecost) and he was the first stone in the temple of the Watchtower, the cornerstone laid upon the foundation of Jesus Christ himself. The temple of FDS3 came into the right condition in 1931Ab7. All transgressions that cause desolation are the same. They are the idolatry of a 'new' 'unifying' world order by an old true religion. The Jews fell for the new unifying world order of Antiochus Epiphanes, they then killed Jesus in a further transgression. The first century Christians fell for the new religious unifying world order of the Roman Catholic church (even Peter himself fell at first). Christendom fell for the new unifying world order of the League of Nations. The Watchtower fell for the new unifying world order of the United Nations. And now in 2007 all the world will be required to accept the mark of the UN, which is the approval of the UN. All corporate entities will be required to become UN NGOs and be 'married' to the UN and therefore take its name. All individual humans will be required to register with the UN, they will then get a UN ID number, the number of its name. And nearly all of these people and corporations will think and believe the lie that this is a brand new and brilliant idea to combat terrorism. This is because these people have given up thinking for themselves, they have given up researching man's history for themselves. They have become like the lemming that follows others over the cliff and like the bull that follows the lead bull into the Abattoir. This is not a knew idea, it is an old trick of Satan. It is a trick that he has used no less that 4 times already! It is always a mechanism for him to destroy the true religion. For more on Daniel 8 see U157. 8 Now as for me, I heard, but I could not understand; so that I said: O my lord, what will be the final part of these things? 9 And he went on to say: Go, Daniel, because the words are made secret and sealed up until the time of [the] end. 10 Many will cleanse themselves and whiten themselves and will be refined. And the wicked ones will certainly act wickedly, and no wicked ones at all will understand; but the ones having insight will understand. 11 And from the time that the constant [feature] has been removed and there has been a placing of the disgusting thing that is causing desolation, there will be 1,290 days. So from the removal of the constant feature, when the JWs became a false religion and from the time that the disgusting thing causing desolation is placed, there will be 1290 days. When do these 1290 days end? Well Gabriel tells Daniel in the next verse to 'go toward the end'. And Gabriel was answering the question: 8 What will be the final part of these things? (Daniel 12), when he said there would be 1290 days from the removal of the constant feature and the placing of the disgusting thing. So the 1290 days end with the end of the world. Now 1290 days after 2004Elul14 is 2008Nisan14. QED. For more on this see U152. 9 Look! I will give those from the synagogue of Satan who say they are Jews, and yet they are not but are lying look! I will make them come and do obeisance before your feet and make them know I have loved you (Revelation 3). 19 Woe to the pregnant women and those suckling a baby in those days! (Matthew 24). 17 Woe to the pregnant women and those suckling a baby in those days! (Mark 13). But this was not the start of the Great Tribulation on the world. Men did not become faint out of fear as a result of Beslan. And we now know, that the Great Tribulation is within the Time of Distress of Daniel12, wherein righteous ones escape by rapture. Technical Notes: We can further prove it from the 77 years from 1931July 23rd (1931Ab6) when the Jehovah's witnesses adopted the name 'Jehovah's witnesses' until 2008Ab, since there are 77 generations from God to Jesus through the maternal line. 77 appears to be a God to Jesus period in bible symbolism. Satan's lease expired on 2011Nisan14. Everyone knows that Isaiah 2, applies to the last days, the final part of the days (Isaiah 2:2). It particularly applies to the mountain of the house of Jehovah (the true religious administration) rising up above all the other mountains (the false religious administrations). So this is the judgement on the Harlot, which is an overt acceptance of the LWs by God. But this precisely describes 911, where valuable commercial airships, air vessels, air ships, hit the high towers of the WTC and the fortified wall of the Pentagon. However this is not a one shot campaign. Isaiah is describing terrorism throughout the day of the big slaughter of Isaiah 30:25. He is giving us the pattern of terrorism, the targets of all the terror campaigns. The terrorists will go for High Towers (such as the UN tower), Military bases (fortified walls) and High Tech (expensive) Mass Transport Systems. These things will be hit again and again until the end. Now the incredible thing about the Twin Towers attack was that the WTC actually had 7 towers in it all of which were destroyed. Even building 7 was destroyed that was further away from the twin towers than say the Millennium Hilton Hotel which is still taking guests today at some $400 per night! So we are sorely tempted to take a time for a tower in this 'sign'. This is not a biblical sign. But is does appear to be saying 7x. The 2nd and 3rd fire signs of 1Kings18 occurs upon a '7th' after having gone back 7x (in fact on 2019September7/8). 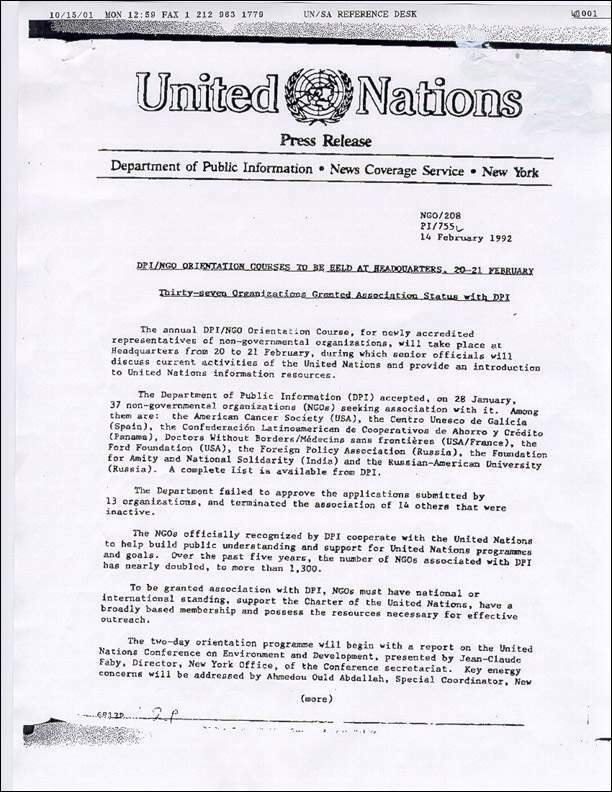 Here is the evidence that the Watchtower applied to join the UN as an associated NGO (that is the only way that an organisation can join the UN) in 1991. They were officially accepted by the UN on January 28th 1992. They were exposed in the UK Guardian newspaper as Hypocrites on October 8th 2001 and they were disassociated by the UN (at the Watchtower's request) on October 9th 2001. [B] Harlotry with the UN is a sin for which there is no atonement for the Watchtower. [C] The way that any Church rides the Beast is by joining the UN as an associated NGO. This is the only way for such an organization to join the UN. All major world religions are associated NGOs to the UN. Jesus' advice was that on catching sight of the disgusting thing, one should flee to the mountains and not return to the house. So having understood that the master is asking his sheep to leave the house of the now evil slave of the fallen Watchtower, the reader will want to know where these mountains of the Lord are. Well, dear reader, visit www.biblecodeintro.com for the answer to that. [A] It really happened ! Here is a letter from the UN in response to an enquiry about the Watchtower. Recently the NGO Section had been receiving numerous inquiries regarding the association of the Watchtower Bible and Tract Society of New York with the Department of Public Information (DPI). This organization applied for association with DPI in 1991 and was granted association in 1992. By accepting association with DPI, the organization agreed to meet criteria for association, including support and respect of the principles or the Charter of the United Nations and commitment and means to conduct effective information programmes with its constituents and to a broader audience about UN activities. In October 2001, the Watchtower Bible and Tract Society of New York requested termination of its association with DPI. Following this request, the DPI has made decisions to disassociate the Watchtower Bible and Tract Society of New York as of 9 October 2001. His telephone-line is: (212) 963-8070. On the 9th October 2001, as a result it become known that the Watchtower had been riding the beast for nearly 10 years, the Watchtower terminated its association with the UN. But just because the woman gets off the Beast does not mean she has stopped being a Harlot. Here is a copy of a fairly open letter from the JW Administration both admitting and attempting to justify their 10 year ride on the back of the Beast of Revelation 17. Our purpose for registering with the department of Public Information as a non governmental organisation (NGO) in 1991 was to have access to research material available on health, ecological and social problems at the United Nations library facilities. We had been using the library for many years prior to 1991, but in that year it became necessary to register as an NGO to have continued access. Registration papers filed with the United Nations that we have on file contain no statements that conflict with our Christian beliefs. Moreover, NGOs are informed by the United Nations that “association of NGOs with the DPI does not constitute their incorporation into the United Nations system, nor does it entitle associated organizations or their staff to any kind of privileges, immunities or special status”. Still, the criteria for Association of NGOs – at least in their latest version – contain language that we cannot subscribe to. When we realized this, we immediately withdrew our registration. We are grateful that this matter was brought to our attention. We trust that the above is, helpful in counteracting attempts of opposers to discredit us. Yes. Talk about selling your birthright for a bowl of soup. Whilst it may be true that their registration papers which are filed with the UN and with the Watchtower contain no idolatrous statements, the terms and conditions of being a UN NGO were that the Watchtower had to agree to support the principles of an organisation which in scriptural terms is going to do battle with the lamb, and is therefore an enemy of Jesus on earth. The above is a despicable political statement designed not to atone for their huge sin before God but rather having failed to hide their associate status with the UN from the brothers they are now trying to hide and to misrepresent by omission the nature of that status from their flock. But who are they kidding? Do they believe that God himself is blind? He is not. He gave Jesus, who gave the angel, who gave John information showing that the new covenant saints would ride the beast - back in the first century - see . This directory is published by the Non Governmental Organizations and Institutional relations section of the UN Department of Public Information. The NGO resources centre, Room 104 is on Tel: 212 963 7234 and on Fax: 212 963 6914.
info@uniclondon.org or call them on 0207 7630 1981, or Fax them on 0207 976 6478 to get a faxed copy of the relevant page of the directory yourself if you require it. They are very helpful. [B] How bad a sin is it ? We do not see how we can condemn then in any stronger terms than they have used to condemn themselves. God’s true church does not sign any agreement drawn up by the UN. The UN signs an agreement drawn up by God’s church if they want to do anything with a holy body. God’s law is superior to man’s law, not vice versa. The only way the true church should join up with them is if they all get baptised into the church, that way the temple is kept clean! A non-governmental organization (NGO) is any non-profit, voluntary citizens' group which is organized on a local, national or international level. Task-oriented and driven by people with a common interest, NGOs perform a variety of services and humanitarian functions, bring citizens' concerns to Governments, monitor policies and encourage political participation at the community level. They provide analysis and expertise, serve as early warning mechanisms and help monitor and implement international agreements. Some are organized around specific issues, such as human rights, the environment or health. Their relationship with offices and agencies of the United Nations System differs depending on their goals, their venue and their mandate. Over 1,500 NGOs with strong information programmes on issues of concern to the United Nations are associated with the Department of Public Information (DPI), giving the United Nations valuable links to people around the world. DPI helps those NGOs gain access to and disseminate information about the range of issues in which the United Nations is involved, to enable the public to understand better the aims and objectives of the world Organization. How do NGOs and DPI cooperate? Promoting UN observances and international years established by the General Assembly to focus world attention on important issues facing humanity. When did the DPI relationship with NGOs begin? "...actively assist and encourage national information services, educational institutions and other governmental and non-governmental organizations of all kinds interested in spreading information about the United Nations. For this and other purposes, it should operate a fully equipped reference service, brief or supply lecturers, and make available its publications, documentary films, film strips, posters and other exhibits for use by these agencies and organizations." In 1968, the Economic and Social Council, by Resolution 1297 (XLIV) of 27 May, called on DPI to associate NGOs, bearing in mind the letter and spirit of its Resolution 1296 (XLIV) of 23 May 1968, which stated that an NGO "...shall undertake to support the work of the United Nations and to promote knowledge of its principles and activities, in accordance with its own aims and purposes and the nature and scope of its competence and activities". The NGOs officially recognized by the DPI co-operate with the United Nations to help build public understanding and support for United Nations programmes and goals. "What are the Criteria for NGOs to become associated with DPI?" Have the commitment and means to conduct effective information programmes about UN activities by publishing newsletters, bulletins, and pamphlets; organizing conferences, seminars and round tables; and enlisting the cooperation of the media. "What is the procedure for NGOs to become associated with DPI"? An NGO that meets the established criteria should send an official letter from its headquarters to the Chief of the NGO Section, Department of Public Information, expressing interest in association with DPI. The letter should state the reasons why the organization seeks such association and should briefly describe its information programmes. This letter should be accompanied by at least six samples of recent information materials produced by the applying organization. Letters of reference from UN Departments, UN Programmes and Specialized Agencies, and/or UN Information Centres and Services (UNICs and UNISs) will greatly enhance consideration of the application. Non-Governmental Organizations formally associated with United Nations through the Department of Public Information (DPI) disseminate information about the work of the United Nations to their memberships and endeavour to build knowledge about the United Nations and support for the Organization at the grassroots level. Informally, these organizations are known as "DPI/NGOs". A person might renounce his place in the Christian congregation by his actions, such as becoming part of an organisation whose objective is contrary to the bible, and hence is under judgement by Jehovah God. (Compare Revelation 19:17-21; Isaiah 2:4) So if one who was a Christian chose to join those who are disapproved of God, it would be fitting for the congregation to acknowledge by a brief announcement that he had disassociated himself and is no longer one of Jehovah's witness - The Watchtower, September 15, 1981 page 23. Jehovah is a God of integrity, not of expediency or of politics. The Watchtower are disfellowshipped by their own words. During the last sixteen years of his career, Robert Muller worked directly with three secretaries-general, U Thant, Kurt Waldheim and Javier Perez de Cuellar, as director of the secretary general's office, as secretary of the Economic and Social Council and as deputy under-secretary-general for coordination and interagency affairs in the secretary-general's office. In this capacity he helped coordinate the work of the thirty-two U.N. specialized agencies and world programs. He was also in charge of launching several world conferences and international years. Appointed assistant secretary-general by Perez de Cuellar, his last assignment at the U.N. was to organize the fortieth anniversary of the U.N. in 1985. Muller received the 1989 UNESCO Peace Education Prize, the 1993 International Albert Schweitzer Prize for Humanities, and the 1994 Eleanor Roosevelt Man of Vision Award. Here is a quote from “Prayer and Mediation At The United Nations” (The Watchtower 1st June 1991 describes this a an excerpt from a recent book by Robert Muller). The whole of the above less the underlined part was quoted in the Watchtower Magazine of 1st June 1991 on Page 17. But the underlined part of course is the crucial quote. It defines precisely what it means for a harlot church to ride the beast. Very simply you saddle up by becoming an associated NGO. There is no other mechanism for a religious organization to join the UN in order to ride the beast. So the Watchtower saddled up on January 28th 1992 and dismounted on October 9th 2001.